Of all the terrestrial mammals, primates have by far the largest brains relative to their body size, with humans having the largest of all. The enlargement is almost exclusively in the neocortex, which makes up more than 80% of the mass of the human brain. Large brains, despite being energetically costly, benefited primates because they conferred complex cognitive skills. But which skills were the priority — was it clever food-finding strategies that were most valuable, for example, or complex social skills? Now Byrne and Corp have studied a catalogue of observations of deceptive behaviours in wild primates from many researchers over several years up till 1990. They found that the frequency of deception in a species is directly proportional to the average volume of the animal’s neocortex. Bush babies and lemurs, which have a relatively small neocortex, were among the least sneaky. The most tactically deceptive primates included macaques and the great apes — gorillas, chimpanzees, bonobos and orang-utans — which also have the largest neocortex. Deception amongst primates is well documented. Sometimes a female gorilla will mate with a male surreptitiously to avoid a beating from a more dominant male. Or monkeys might feign disinterest in tasty food so that others do not come and steal it. Byrne has himself observed a young baboon dodging a reprimand from its mother by suddenly standing to attention and scanning the horizon, conning the entire troop into panicking about a possible rival group nearby. “We were rather shocked that baboons could do anything quite as subtle as that,” he says. Both the Axis and the Allies printed aerial propaganda leaflets using sexual themes in an attempt to demoralize enemy soldiers at the front. Did these leaflets work? Did the finders become emotionally crippled and unable to carry on their duties and responsibilities? Just the opposite occurred. The ‘pin-up’ pictures became collectors items sought after by the troops who greedily collected and swapped them. If anything, the leaflets raised morale. There is no doubt that they were the most heartily appreciated propaganda leaflets used in World War 2. We can probably state that they were the most widely read and circulated enemy documents of any war. Nothing was going right for the residents of northern Iwate prefecture. Try as they might, the people of Iwate seemed stuck in a poor backwater, with factories closing, shaky state finances and few prospects. So, three years ago, Gov. Hiroya Masuda sent out a bold new message: Just give up. “We don’t make an effort in Iwate,” Mr. Masuda declared in a nationwide ad campaign that has run annually since 2001. Iwate should build traditional wooden houses rather than modern buildings, he said. Instead of striving like the big cities for economic growth, people should take pride in their forests. The wacky ads have been a hit. They boosted Mr. Masuda’s standing in Iwate, helping him get elected for a third time last year, with 88% of votes cast. They also struck a chord with Japanese nationwide. Opposing effort in Japan is as bizarre as disparaging freedom in America. But since their economy slowed in the 1990s, many Japanese have started to question whether their hard work was really worth it. In the past, even average Japanese workers who devoted their lives to a corporation could prosper. “If you graduated from college and worked solidly, you would reach an annual salary of ?10 million,” about $90,000, says economist Takuro Morinaga, author of a shelf of downshifting bestsellers with titles such as “It’s Cool to Be Poor.” But now that not everyone gets rich, “They think, why should they work themselves to death for their company?” he says. The Coast Guard is serving as the oil police here [in the Persian Gulf]. It’s a somewhat novel role for the service, which traces its roots to 1790, when Treasury Secretary Alexander Hamilton cajoled a young and cash-strapped Congress to build a fleet of 10 cutters — called the Revenue Service — to collect tariffs. Coast Guard sailors pitched in during World War II and then patrolled Vietnam’s shallow waters two decades later. Time may be many things — money, an enemy, a healer, something either saved or wasted — but at work it’s never on your side. Employees think it moves too slowly. Managers believe it goes too fast. In general, their different perspectives illustrate the great divide between bosses, who tend to think that presence equals productivity, and workers, who often feel forced to provide proof of their commitment. That’s because even though everything takes less time today than in our horse-and-buggy past, no one seems to have enough. According to a survey conducted by the Families and Work Institute, a center for research on the changing work force, 67% of respondents said they don’t have enough time for their children, while 63% have shorted their spouse or partner, up from 50% 11 years ago. Mr. Sud leaves his house at 6:30 a.m. and drives about 10 minutes to his health club, Mecca, located across the street from his office in downtown Austin. From there, he runs various loops around Town Lake, generally around 45-50 minutes. He ends up back at the gym, where he stretches and, twice a week, lifts weights. By 8:30 a.m., he’s at the office. Some people are born to run. At 6:30 a.m. I’m not. “Popular in European racing circles for years, pocket bikes have recently exploded on the scene in California,” Wired News: Speedy, Tiny and Troublesome explains — and from my recent visit back to California, I can attest to this; the miniature motorcycles were being sold by the road in the desert. Ionko tells customers the bikes aren’t street-legal, and though he’s heard those with lights could be, the DMV won’t let riders register them. Many pocket bikes also lack the 17-digit VIN, or vehicle identification numbers, that motor vehicle manufacturers stamp on each product. Ionko and others believe this may be an obstacle to registering them. Terri Johnson, a manager with the state’s DMV, said the VINs have nothing to do with pocket bikes’ illegality on streets — it’s really about the bikes’ failure to meet safety standards, she said. Jobs also introduced Apple’s largest display yet: a 30-inch flat-panel display in a sleek, trim aluminum housing. Complementing the company’s new 23-inch and 20-inch flat-panel screens, also in aluminum housing, the giant display will be available in the fall for $3,300. Unlike its smaller siblings, the new screen will work only with Power Macs equipped with a new $600 GeForce video card from nVidia that features dual DVI outputs — one for each half of the 2,560 by 1,600, 4.1 million-pixel screen. The geek in me actually got excited when I read that it required two DVI connections. Sick, I know. Al Safa operates under the slogan, Hand Slaughtered by a Muslim, and their website features their “slaughtermen”, Ahmed Omur & Osman Salih. Granted, they’re referring to halal chickens, but, really, that slogan’s a bit much. During the 16th century, when the witch craze swept Europe, it was those areas with the best-developed inquisitions that stopped the hysteria in its tracks. In Spain and Italy, trained inquisitors investigated charges of witches’ sabbaths and baby roasting and found them to be baseless. Elsewhere, particularly in Germany, secular or religious courts burned witches by the thousands. The old adage that there are “no atheists in foxholes” does not appear to apply as much as it used to. It turns out that the active duty troops in the American armed forces are somewhat less religious than the population as a whole. Americans over all are 78 percent Christian, 1.3 percent Jewish, .5 percent Moslem, .4 percent Hindu, 13 percent unknown or none and the rest various other sects and faiths. But the troops are 55 percent Christian, .3 percent Moslem, .27 percent Jewish, .04 percent Hindu, .24 percent Buddhist and 34 percent unknown or no preference. Part of this may be a generational thing, as the troops are younger than the population as a whole. People become more religious as they get older. Another factor is probably education, as the high education standards for recruits means those in uniform have several years more formal education than their civilian peers. More literate too, as people in uniform read at a level a full year ahead of civilians. As people become more educated, they tend to be less religious. While most religions are underrepresented in the military, there are some exceptions. The Mormons (Latter Day Saints), represent 1.3 percent of the American population, and 1.1 percent of the troops. Catholics, which are 25 percent of the population, are 22 percent of the troops. The Mormons are recruited energetically by the military. Mormon families emphasize education and clean living for their kids, which makes them ideal candidates for enlisted or officer slots. Because nearly all Mormon men spend two years as missionaries, and many do this in foreign countries (after learning the local language at Mormon schools), Mormons are particularly sought after for intelligence, translation and Special Forces jobs. The largest concentration of reserve Military Intelligence units is located in Utah, a state with a majority Mormon population. If Mormons cannot be enticed into active duty, the armed forces makes it easier for the well educated and multi-lingual Mormons to join these reserve units. Even so, when American troops work with those from other countries, the foreign soldiers are surprised at how ?religious? the U.S. troops are. That?s because the United States has the highest rate of religious participation in the industrialized nations. U.S. Navy sleep studies have discovered another thing to look for when selecting sailors for different kinds of duty. The study found that ?short sleepers? (those who typically slept for six hours or less a night), were more alert when they were awakened, but were much less alert after 36 hours without sleep. ?Long sleepers? (those who require nine or more hours a night) took longer to become completely alert when they were awakened, but were much more alert after 36 hours or more of being awake. So if you have to wake up people for an emergency that requires concentration, pick a ?short sleeper.? If you need people who might have to stay awake for long periods, and still be able to function, pick a ?long sleeper.? One of the least mentioned reasons why snipers are increasingly popular in the U.S. Army and Marines, has to do with logistics. During the Vietnam war it was discovered that 200,000 rifle bullets were fired for each enemy soldier killed. But snipers fired 1.3 bullets for each enemy soldier killed. The 200,000 5.56mm and 7.62mm bullets weigh over four tons. But 1.3 7.62mm sniper bullets weighs a little over an ounce. OK, so snipers fire more bullets in training, but that’s still going to end up with four tons being compared to a few pounds. You cannot have an army of snipers. There are many combat situations (like being ambushed), where a sniper getting off single, well aimed, shots would not be the most effective response. If you are ambushed, you want to put as many bullets on where you think the enemy is, as quickly as possible. But there are many combat situations where a few well placed shots will do a better job than hundreds of less well aimed bullets. Even for the regular troops, single shots are now favored over emptying a 30 round magazine with fully automatic fire. Every bullets counts, especially when you have to move them thousands of miles before you can use them. This could take some explaining. Peter K. Hochla came home from a trip to find a notice from the Transportation Security Administration that his suitcase had been opened for inspection. But TSA left more than a calling card: Dr. Hochla found a pair of woman’s underwear in with his things. The character will no longer be known as Peter Parker — but will become the young Pavitr Prabhakar. He will also have a more modest costume, wearing a dhoti, the loincloth worn by men in India. There will initially be four comic books produced, released to coincide with the Spider-Man 2 movie. The first film was a huge success in India. When the first Spider-Man movie opened in India, it took 67m rupees (?940,000) in its first four days of release — and made more in its first weekend than any Hollywood movie yet released in India. If the first Spiderman movie was a huge success, why are they “transcreating” the character? 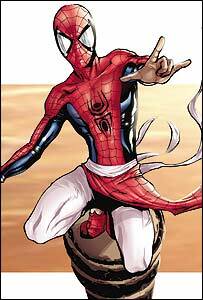 Spider-Man would become an Indian boy in Mumbai and dealing with local problems and challenges, he added. Spider-Man India will interweave local customs, culture and mystery to make it more relevant to the readers, set against the backdrop of monuments including the Taj Mahal and the Gateway of India. The Green Goblin villain will be replaced by Rakshasa, an Indian mythological demon that has shape-shifting abilities. If you’re going to change the character’s costume, setting, and enemies, why not create a new character? On Sunday night, a man in his 30s attacked a column of the Doge’s Palace on St Mark’s Square with a hammer, battering the statue of Moses, witnesses said. He fled after a group of Italian tourists alerted the police. The night before, someone chipped off the hands from statues of St Mark and St Francis outside the 16th century Church of the Redeemer on the island of Giudecca. Geologist Laszlo Toth took a sledgehammer to Michelangelo’s Pieta in the Vatican in 1972, shouting “I am Jesus Christ!” Two decades later, an Italian painter smashed one of the toes of Michelangelo’s statue of David in Florence.